The Atom is aging and de-aging quickly and randomly. By end, he is restored to pre-Zero Hour status. After being saved by Superman the Green Lantern ages to a 90-year-old man. Green Lantern starts aging backwards. Green Lantern still is aging backwards. He is returned to normal by Waverider. The Titans are at a carnival. Robin and Starfire are sitting on a Ferris Wheel, watching the Fireworks while Beast Boy and Cyborg play carnival games to try to win a giant chicken for Raven. Back at the Ferris Wheel, a strange tentacle captures Starfire and Robin calls the others. Starfire begins getting pulled across the water, but finally breaks free. She flies back to the others, and they all fight the weird robot thing. Robin defeats it by pulling out it's wires. Then they all head back to the Titans Tower, but when they get their a strange visitor is in the main room. It's Starfire's older sister, Blackfire. Blackfire and Starfire talk, and Blackfire gives her some kind of rare Emerald, called a "Centari Moon Diamond". Blackfire makes quick friends with the Titans, and the Titans begin spending most time with her and not Starfire. This makes Starfire mad and she feels like everyone is completely ignoring her. Then, Blackfire reckons having everyone go to a dance floor. They go there, but Starfire, feeling left out, just sits on top of the Dance Floor, Raven sits down and talks to some goth kid, and Robin, Cyborg, and Beast Boy dance with Blackfire. Robin eventually notices that Starfire isn't in the dance floor, and talks to her up on the roof, but Blackfire comes out and pulls him back into the dance floor. Robin goes back out and talks to her again. But Blackfire comes back out, and Cyborg says that there's trouble. It turns out that the old robots from the carnival are back. The Titans go out to fight them, and after Blackfire shoots them, the Titans compliment her and Cyborg offers her to be a Titan. Now Starfire feels really left out, and once they get back to the Titans Tower, she decides to leave. Robin sees her and asks if she's at least gonna say goodbye, but some robot catches her and takes her aboard some Spaceship. Robin jumps onto it and holds onto the bottom of it. Then he pops on top, defeats the robots, and frees Starfire. The Spaceship crashes, and the other Titans head out to see what happened. The Robot says that she has committed robberies. Starfire says she's innocent, and it turns out that Blackfire was just tricking them so she could get away with her robberies. Starfire and Blackfire have a showdown, and Blackfire is taken prisoner by the robots. Starfire decides to stay. While at a rave party Star Fire makes a mistake in a casual conversation and feels a little small. Raven's creepy tantrum of crackling black energy leaves Dr. Light begging for mercy, and the Titans see a new side of Raven- her temper. But, when Cyborg and Beast Boy find a Mysterious Mirror in Raven's room, they're suddenly transported to a strange nightmare world that's somehow connected to Raven. While in Raven's mind Cyborg and Beast Boy meet Raven's timid personality. She shrinks to a little girl when Beast Boy yells at her. It's Blathorg (sic) Day for Starfire, but the Titans are squabbling among themselves as usual. 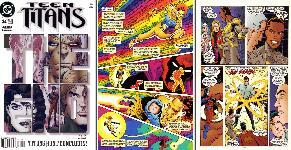 They're interrupted by the Titans Alert - a villain from the future, Warp, is stealing a priceless antique clock. He manages to escape through a time portal, but Starfire pursues him and in the struggle, they both get dropped into the future 20 years down the road - Starfire has Warp's time-travel device. Starfire looks for her friends, and finds an aged and obsolete Cyborg stuck in the Titans Tower with a limited power supply. He directs her to Beast Boy and Raven - BB is a balding circus freak, and Raven has donned a white cloak and locked herself away to contain her powers full-time. Neither one of them will help Starfire, whom Warp attacks to get his time-travel device. Robin, now "Nightwing," intervenes - Warp escapes and Nightwing/Robin summons the Titans once more. Everyone comes and together they manage to defeat Warp, who reverts to a baby. Cyborg uses the time travel device to send Starfire back to a seconds after she left, and she convinces everyone to celebrate Blathorg Day, (hopefully) changing the future. Older Beast Boy: (Looks at Warp crying (a baby) Okay, I am NOT changing any diapers. The Teen Titans are chasing a jewel thief who has a spider for a head (his name is Fang) All the other titans except Starfire get caught in a goo Fang spit out. Robin gets hit by some sort of laser beam from Fangs fangs. The beam has a poison in it and temporarily make Robin unable to move except for his mouth. Cyborg, Raven, and Beast Boy are at a bridge fighting thousands of mutated moths. 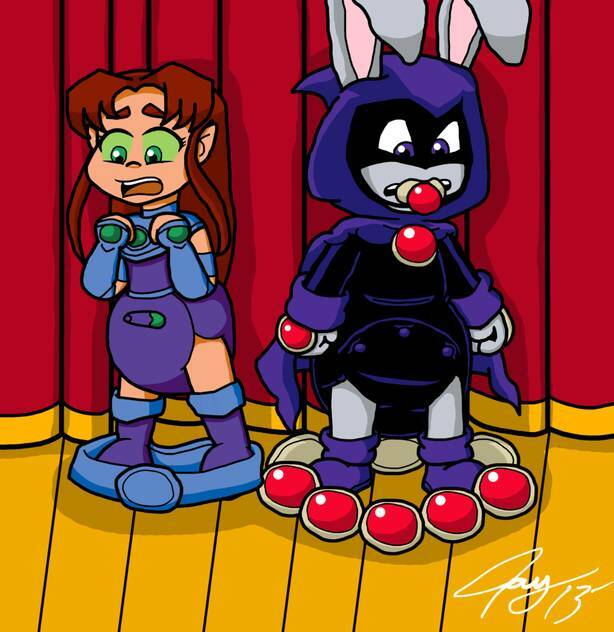 Meanwhile at the titans tower Starfire is doing tamerianian (not sure if that�s the right spelling) pressure on Robin. Once she does that he can move again. Robin calls Cyborg and Cyborg says things look pretty bad. Robin say that they are on there way, when Killer Moth intercepts the call and takes over. Killer Moth wants Robin to go with his daughter Kitten. Starfire completely freaks out about it. Robin agrees after telling Starfire he really doesn�t want to. He calls Cyborg again and tells the rest of the titans to search for the connection of Kitten and Killer Moth. Robin arrives at the prom on his motorcycle. He turns around and Starfire is behind him. Robin says that she should be investigating Kitty and Killer Moth. Starfire reply s with that she will investigate Kitten at the prom. Kitten rides up in a pink limo and brags about Robin being her date. She makes Robin walk her onto the yacht (where the prom is) arm in arm. Starfire freaks out and hits the front of the limo sending it into the air and breaking it. Kitten and Robin are sitting at a table while Starfire watches from a short distance. Meanwhile Cyborg Raven and BB found her house and are in the basement fighting Killer Moth. At the prom the button was pushed and all the moths were let out. Cyborg Raven and BB seal all the exits. Back at the Prom Fang shows up and gives Kitten a bunch o jewelry he stole. Then a fight breaks out between Dobin and Fang. Starfire shots a star bolt at Fang and tells him to keep his legs of her boy (which would be Robin). The fight goes on and on. Eventually Robin breaks the controller for the moths turning them back into larva. Police come and arrest Kitten and fang. In the Police Van there is Killer Moth. 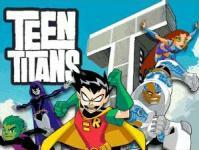 All of the Teen Titans are on the yacht. Spotlight circle around Robin and Starfire and a voice declares them prom king and queen. Robin says "I guess one more dance wouldn't kill me" He takes Starfires hand and they walk to go dance together. Beast Boy: You know, now that nobody's making them on mutating, these little guys might actually make good pets. Raven: "Don't even think about it. The Titans hold a 4th of July party. Everything is going well until Mad Mod crashes the party. He claims that the American Revolution was a hoax and claims the city for England. Worse, wanting to get back to his youth, he steals Robin's youth, turning Robin into and old man!